1. Cut off the tough ends of the Broccoli Rabe stems. With a paring knife peel the stem, working your way around until it’s completely peeled. As you peel the stem, some of the large tough outer leaves will also be removed, discard those as well. Repeat with the remaining stems. 2. Wash the trimmed Broccoli Rabe. Drain in a colander. 3. Heat the 2 TB of EVOO in a large skillet over medium heat. Scatter on the Garlic & cook, until golden brown, about 1 or 2 minutes. Remove & set aside. 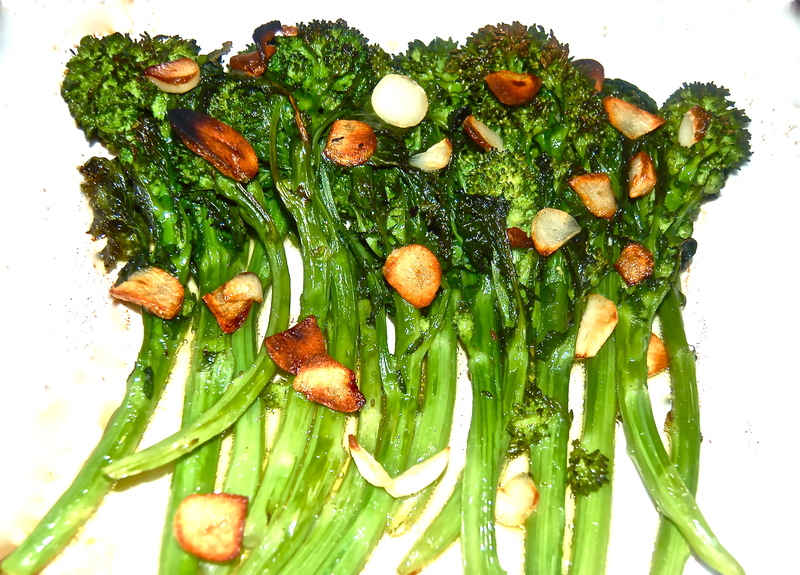 Carefully place the Broccoli Rabe stems into the hot Oil, season lightly with Salt & the 1/4 teaspoon crushed Red Pepper. Stir & toss to combine. 4. Pour 1/3 cup water into the skillet and bring to a boil. Cover tightly & cook, lifting the lid to turn the stalks occasionally, until the Broccoli Rabe is fork tender. Taste & season with additional Salt & crushed Red Pepper if necessary. Return the Garlic slices to the pan. 5. Move the sauteed Broccoli Rabe to an oven proof casserole dish & place in the still hot 450F oven. Roast for 10 minutes. 6. Divide onto dinner plates & serve.